The “it” was the elusive Higgs boson, something for which the physics community has been searching for decades to complete the so-called Standard Model which describes the fundamental building blocks of our universe. In December I wrote about the Higgs and the building excitement as physicists began to see signs of its existence. See my blog about the Higgs and the Standard Model here. Sometimes called the “God” particle the Higgs is a theoretically postulated particle that endows mass to matter. 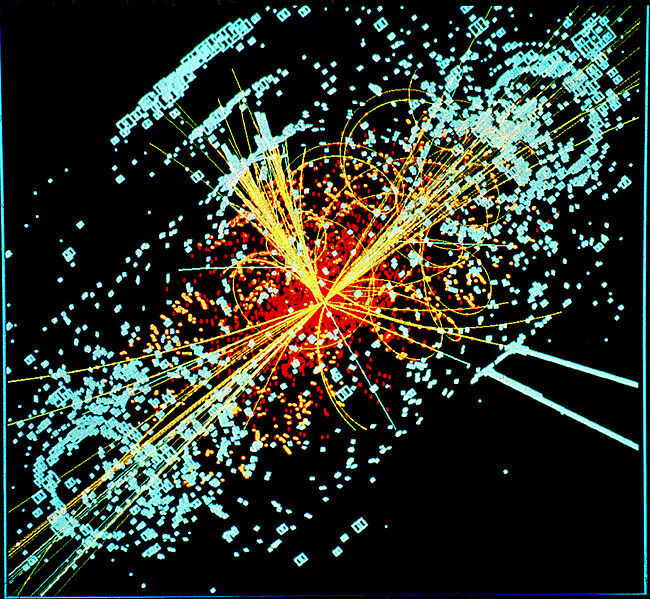 Without the Higgs field nothing can have mass and the world as we know it cannot exist. If the Higgs were found not to exist we would need to revise all of physics and come up with new theories regarding the fundamental building blocks of nature. The announcement that the Higgs was almost definitely spotted was made at CERN, home of the Large Hadron Collider (LHC), where protons are smashed together at almost the speed of light at energies never duplicated at any other facility. As they collide the energy of the protons is converted to other fundamental particles, including the very, very short lived Higgs that decay rapidly, but into predicted decay products that are analyzed in massive detectors. See a wonderful video explaining the whole process and capturing the jubilation at CERN at the announcement, below. 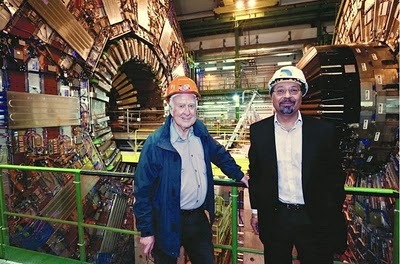 Peter Higgs (on the left) and Prof. Tejinder Virdee at the CMS detector. Photo source is CERN. The world’s largest superconducting magnets cooled by the world’s largest refrigeration system. These are used to accelerate protons in the underground tunnel loops to 99.99999999% the speed of light! The highest energy particle beams (4 TeV in 2012) and collisions ever achieved. The most sophisticated detectors ever conceived are deployed. The ATLAS (stands for A Toroidal LHC Apparatus) detector, for example, is located at the point where the proton beams intersect and tracks, identifies and measures the myriads of particles produced. This detector alone weights about 7000 tons (as much as the Eiffel Tower) and has a dedicated team of 3000 physicists from 174 universities in 38 countries studying its output. The other general purpose detector is called the CMS (Compact Muon Solenoid) – pictured above – with silicon pixels and silicon strip detectors to capture the tracks of charged particles and a muon detector. CMS too has an independent team of physicists studying its huge data output – 3000 physicists from 183 institutes and 38 countries. One such country is India which has an important node in the data processing worldwide collaboration at TIFR (Tata Institute of Fundamental Research) and through a 1 gigabyte-per-second direct link to the data via Fermilab. TIFR then distributes the data to other universities and labs around India for independent evaluations and analysis. Out of, oh about, 10,000,000,000,000,000,000,000,000,000,000,000 or so proton-to proton fly-by’s (so far) the total number of excess decay particles with the specifics we seek to confirm the existence and mass of the Higgs is only about 200 particles! It’s looking for the ultimate needle in the haystack. Amazing what signal to noise ratios our modern experiments and computing can achieve. I am making a trip to India next month where I am planning to meet with several of the physics groups working on the Higgs data and learn first hand about the epochal discovery and the exciting work that remains to pin down many of the still unanswered questions regarding the Higgs. I hope to visit TIFR as well as other auxiliary centers doing some world class physics. See a great presentation (dated August 29, 2012) posted by Professor Kajari Mazumdar of TIFR about India’s role in the discovery of the Higgs. With the LHC we have essentially built a time machine that takes us to within a trillionth of a second after the Big Bang when the temperatures had cooled enough (to about 10,000,000,000,000,000 degrees C) for the Higgs to form and endow everything with mass. It’s amazing that we can conceive and experimentally do such things! This entry was posted in Cosmology, Evolution, Innovation, Money, Politics, Science. Bookmark the permalink. great writing….i am delighted to know that you plan to visit TIFR where i worked between 1971 and 1974 in their computer science group in physics dept. have a successful and fun trip. take a walk along the sea side. and can you ask CERN ro uppercase “b” in Higgs boson to honor joint contribution of dr Bose. Thanks. It’s traditional to use lower case once the name (such as Bose) becomes a general purpose physical quantity or unit.. For example: fermions, watts, amperes, volts etc. I think it’s even a bigger recognition when a lower-case unit is named after you. It means you have permeated the vocabulary of Science. Ashok, Another great blog from you. 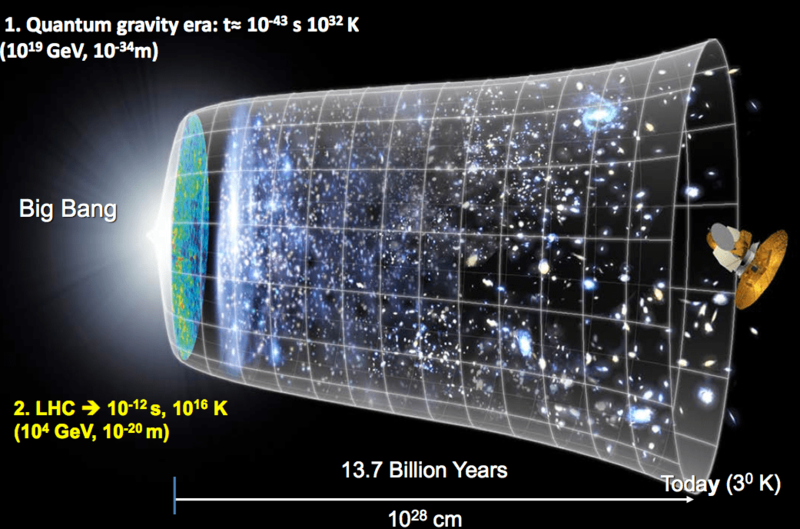 BBC had a coverage on Higgs Boson topic recently titled ..Big Bang: Is there room for God?”…http://www.bbc.co.uk/news/science-environment-19997789..